The newly built Hyatt Union Square New York is a Four Diamond Luxury hotel situated one block from the citys cultural Epicenter at Union Square in the Heart of the Silicon Alley. Antique Limestone Facade: Whitewashed Brick Walls: Restored 25-Foot ceilings in lobby: NYC Lifestyle Hotel offers refreshing mix of Vintage New York with Hi-Tech Sensibility: From the moment you enter the lobby you will sense the spirit of history married with the Ultra-Modern Luxury:Blending simply Contemporary Decor with Natural Elements. Hyatt Union Square New York is one block from Union Square which is a crossroads of Fashion:Culture:Entertainment:Cutting Edge Business: It is the Artistic and Technological Center of NYC: Surrounded by 900 Retail Stores: Off Broadway Shows: Home of World Famous Green Market with Farm-Fresh Produce: Handmade Baked Goods: Flowers: Luxury Hotel is located near Hip Bars and clubs of Meatpacking District: Boutiques in Greenwich Village and 5th Avenue: Art Galleries of Tribeca: Soho: Lower East Side. 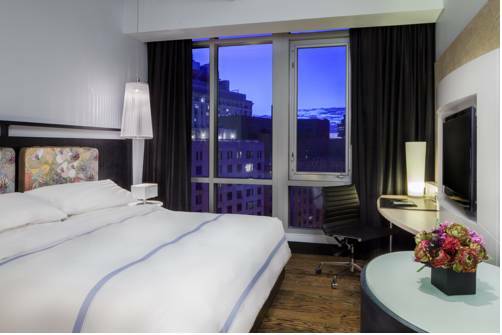 Rooms overlook the streets of NYC or a custom Stone Courtyard: Our stunning accommodations feature Modern Decor with Natural Elements mirroring and escape to Union Square: Each room features Large Windows: 37-inch Flat Screen T.V. Geneva Sound System: Tech-Wired Writers Desk: Designer Bathroom: Some rooms feature oversized Landscaped Terraces with Outdoor Seating for ultimate Downtown Escape. The newly built Hyatt Union Square New York is a Four Diamond Luxury Hotel situated one block from the citys cultural Epicenter at Union Square in the heart of Silicon Alley. Antique Limestone Facade:Whitewashed Brick Walls:Restored 25-Foot Ceilings in Lobby:NYC Lifestyle Hotel offers refreshing mix of Vintage New York with Hi-Tech sensiibility: From the moment you enter the lobby you will sense the spirit of history married with Ultra-Modern Luxury: Blending simple Contemporary Decor with Natural Elements. Hyatt Union Square New York is one block from Union Square which is a crossroads of Fashion: Culture: Entertainment: Cutting Edge Business: It is the Artistic and Technological Center of NYC: Surrounded by 900 Retail Stores: Off Broadway Shows: Home of World Famous Green Market with Farm-Fresh Produce: Handmade Baked Goods: Flowers: Luxury Hotel is located near Hip Bars and Clubs of Meatpacking District: Boutiques in Greenwich Village and 5th Avenue: Art Galleries of Tribeca: SOHO: Lower East Side. Rooms overlook the streets of NYC or a Custom Stone Courtyard: Our Stunning Accommodations feature Modern Decor with Natural Elements mirroring an escape to Union Square: Each room features Large Windows: 37-inch Flat Screen TV: Geneva Sound System: Tech-Wired Writers Desk: Designer Bathroom: Some rooms feature oversized Landscaped Terraces with Outdoor Seating for Ultimate Downtown Escape. Cancel by 3PM hotel time 24 hours prior to arrival to avoid 1 nights room and tax penalty. Cancel policy subject to change. Open all day, locally sourced menu serving Traditional Brasserie Fare with a modern interpretation. offering cutting-edge South American flavors. The Open Kitchen allows diners to engage with the flavors and artfully crafted dishes created by our chef Marco Moreira. Single Malt Scotch Whiskey and Vineyard Wine carefully selected by our master Sommelier. Singl Lounge at Hyatt Union Square offers and extensive selection of over 100 Single Malt Scotch Whiskies. Small Bites are also on the menu.